Our next stop on the QAL is Tyler, Texas! You can head over to Cristina's blog, Pretty Little Quilts, where the talented Colleen Long (IG @sewthreadink) is guest blogging! She has some fantastic tid bits about Tyler and her block is just genius! Be sure to check out the awesome Aurifil giveaway, too! We just love how generous our sponsers have been! 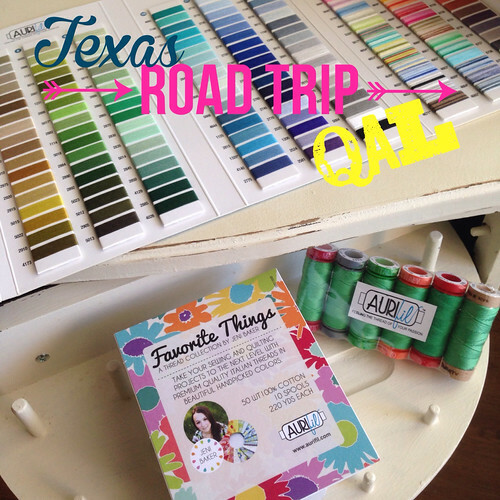 Aurifil gave us enough thread for each of our bloggers/guest bloggers to giveaway on their blog during the QAL. We were just expecting the designer box but also received a sample thread package (with six different thread weights) and a fabulous thread color chart!! Designer boxes and color packs will vary but I promise they are ALL fantastic!!! Now you will know the exact color of thread you need and the correct weight for your project! We love you, Aurifil (and @AlexVeronelli)! Also, some have you might have noticed, but I finally joined the world of Instagram. I know, I'm pretty lame. But if you would like to follow me, I'm @myfabricrelish. I would love to return the Instagram love! 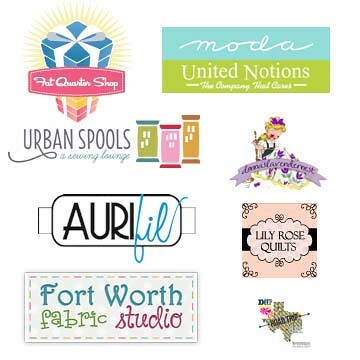 See you there and again next week for Ft. Worth with Fort Worth Fabric Studio! Now go visit Cristina and Colleen!